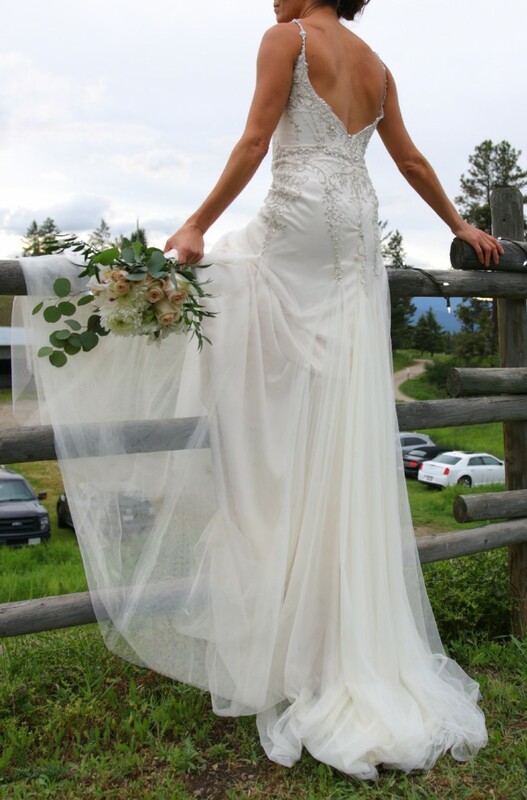 This dress is incredibly light and airy, not too 'traditional' and with just enough class. She was extremely comfortable to wear all day and dance in all night. Vintage inspired, ivory-pewter colouring of the soft tulle gave the Swarovski crystals and glimmering beaded embellishments throughout that extra classy note. The details of this dress are just stunning without overwhelming the look. The dress is a size 8 and fit perfectly as it was. Only a slight tuck under the bust to bring the corset in closer to the body. The waist (corset) rests at the higher waist line with a gentle "hug" at the hips, allowing the natural weight of the the A-line skirt to settle and flow nicely for that perfectly flattering look. I am 167 cm (5.5 feet) and with 5 cm heels, the dress rests at the floor. Purchased new, stored at the bridal shop until just before the day. Dry cleaned immediately after the wedding (June 2018). Now she's just waiting for her next wedding! Minor flaws of top two elastics for button-over-back-zipper are a bit stretched. Otherwise perfect condition! - Custom, 'tiered' bustle to match the flow lines of the dress. - Minimal alterations: straps and corset taken in slightly. - Hemmed - Bra cups added (Size B) - easy to remove. Once you send a message, Robyn can invite you to purchase the dress.